The range of interests displayed by Athanasius Kircher (1602–1680) is staggering, even in a century renowned for universal scholarship. Despite failed attempts to decipher Egyptian hieroglyphics, he was a master of a dozen European and Oriental languages. His forty-odd works include studies of the tower of Babel, ancient Egypt, China, mathematics, music, cosmology, optics, magnetism, and medicine. Both highly praised and an object of ridicule, these works served many seventeenth-century scholars as a ready-reference library on virtually any scientific topic. A Jesuit at the Collegio Romano , Kircher became curator of the university’s museum which housed natural history objects sent to Rome from missionaries around the world. 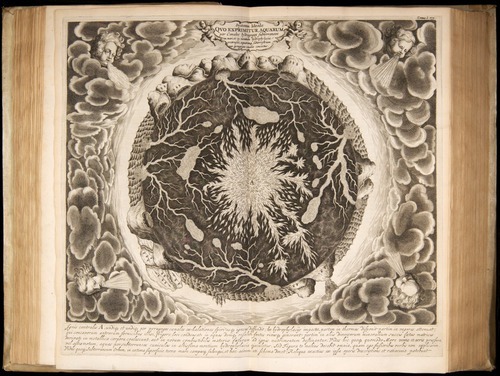 The lavish illustrations of Kircher’s works made each volume a virtual museum, an iconographic encyclopedia of creation designed to aid the reader’s contemplation and devotion as well as understanding. Executed in an exuberant Baroque style, the dramatic sections manifest Kircher’s global vision in a uniquely memorable way. 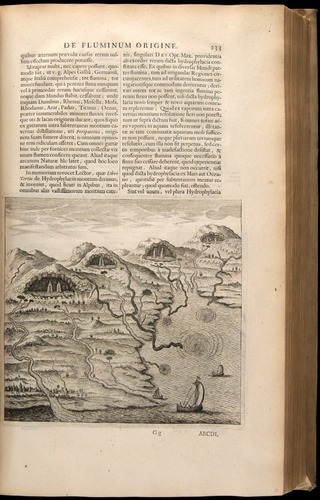 Yet the sections were not printed at the front of the two folio volumes, nor were they displayed in an unusually prominent position; rather, they are found in the midst of a miscellany of regional marvels known through a combination of classical reports, travel accounts, and Kircher’s own observations during field expeditions to nearby sites in southern Italy. 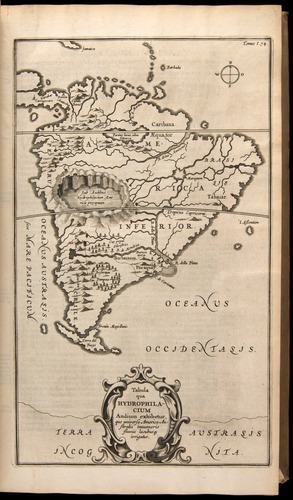 Numerous small-scale sketches throughout Mundus subterraneus illustrate particular surface features and geographical configurations of interest, such as the appearance of hot springs and cold springs in close proximity, or the accounts of the Andes received from missionaries in South America. 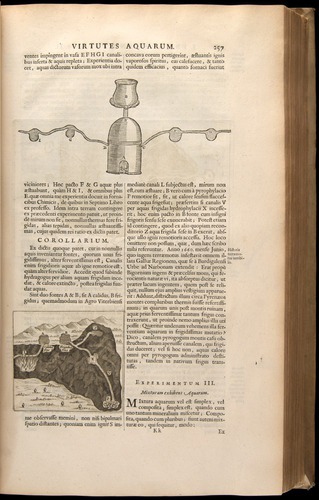 Kircher’s global sections are composites of these regional marvels. Both the regional sketches and the global sections suggest the kinds of underground structures one might suppose in order to explain the surface phenomena observed in particular places around the world. In the Phlegraen Fields (below), Monte Nuovo had formed overnight in 1538, giving vivid demonstration of the power of subterranean fire. 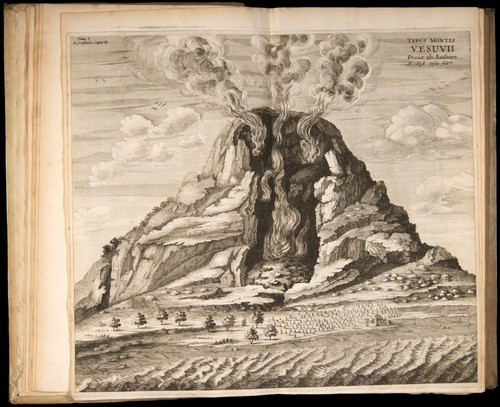 With Vesuvius still smoldering, Kircher hired a local guide to ascend with him to the top for the sake of first-hand investigation, and dared to have himself lowered into the crater in a harness to take temperature measurements. 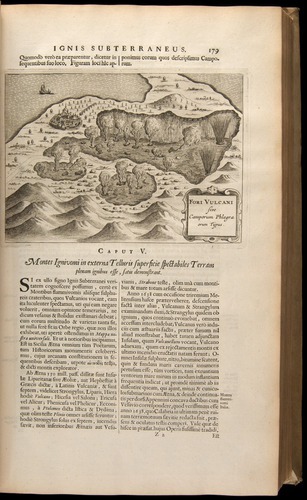 It is no wonder that Kircher used Vesuvius as his Typus Montis. 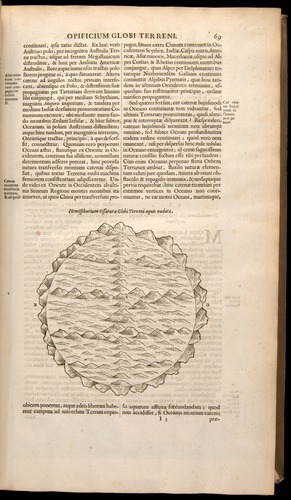 Kircher supposed that chambers within the cavernous Earth called geophylacia were created when the dry land was raised above the sea on the third day of creation. Three types of geophylacia imprison air, water, or fire within the Earth; he called these air-houses, water-houses, and fire-houses respectively aerophylacia, hydrophylacia, and pyrophylacia, which are often found in various relations. Another kind of storehouse contains seminal principles responsible for the growth of minerals and earths in passages beneath the ground. The second global section (below) depicts the subterranean circulation of fire through various fire-houses or pyrophylacia. The Earth is shown as a furnace of activity, pulsing with subterranean drama beneath the surface world of human habitation. Volcanic plumes embroil the borders with a vivid demonstration of the powerful effects of fire. Thick, turbulent smoke overflows the crust of the Earth, which is shown with a greatly exaggerated vertical scale. Fire is “the life of the Macrocosm, as spiritous blood is of the Microcosm.” The largest pyrophylacium at the center of the Earth (A) is hell, in Kircher’s geocentric cosmos the farthest point from heaven and the prison-house of sinners. Purgatory might be a lesser one nearer the surface (B). In the sulfurous environs of the Phlegraen Fields, monks living in a monastery reportedly heard beneath their feet the groans of sufferers in Purgatory. Were pyrophylacia not providentially circumscribed by water, the entire sublunar realm would burn. The fire-ducts (C) give rise to hot springs and minerals. Volcanos provide air to the geocosmic circulation and, like alchemical spiracles or chimney furnaces, offer an outlet for fumes rising from the fires. The mountains like bones of the Earth provide a secure skeletal structure. 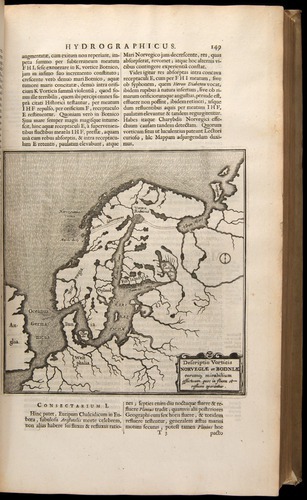 Kircher even suggested that the geographical orientation of mountain chains was ordered, in that they tend to run north-south and east-west. 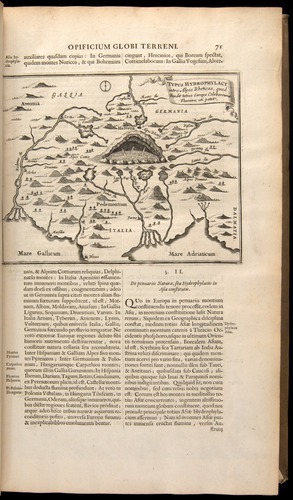 According to Kircher, hydrophylacia lie at the cavernous roots of mountains such as the Alps (below) and the Andes (shown earlier) where they provide the source of springs and rivers. Many rivers flow in subterranean channels for all or some portion of their course to the sea. Ocean whirlpools, such as the marvelous Norwegian maelstrom, mark the submarine entrances of passages which siphon water from the sea back to the mountainous hydrophylacia. Polar views depict the two greatest whirlpools through which water descends into the Earth (note the mountain chains depicted as running east-west in the northern continents). All of these features are represented in the first composite global section shown above, depicting the circulation of water. Myriad subterranean channels keep the water in constant circulation through the Earth, nourishing the growth of minerals and communicating with surface seas and lakes. Water descends to hydrophylacia near the fiery core, providing needed fuel to sustain the subterranean fires. By means of the pumping of the tides which acts like bellows, water in the channels ascends to reservoirs in high mountains. From these it emerges as rivers and springs and returns to the ocean once again. 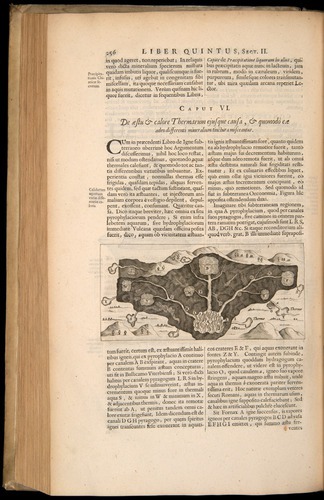 Prompted by his first-hand observation of volcanic phenomena, interpreted in correlation with travel accounts and literary reports, Kircher’s Theory of the Earth (for so it was regarded by many later writers) was a natural expression of his Jesuit instincts for the integration of new observations within the framework of ancient texts. 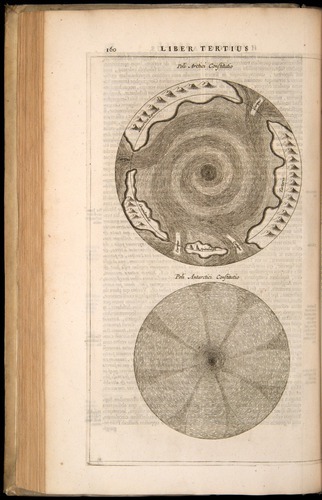 Kircher’s work shows that Theories of the Earth were not uniformly Cartesian in their cosmology nor simply an outgrowth of the mechanical philosophy. 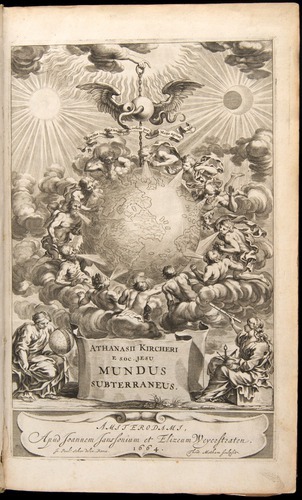 Kircher’s Theory of the Earth was nurtured by his geocentrism because Kircher viewed the Earth as a noble object of study: in defense of Jesuit tradition, the best complement to his enthusiastic tour of the Tychonic heavens in Itinerarivm Exstaticvm was an equally rewarding and more extended sojourn through the subterranean world. This essay is excerpted and adapted from: Kerry V. Magruder, “Theories of the Earth from Descartes to Cuvier: Natural Order and Historical Contingency in a Contested Textual Tradition” (University of Oklahoma dissertation, 2000), pp. 527-538. These are just a few of the images in Mundus subterraneus; we’ve just scratched the surface. 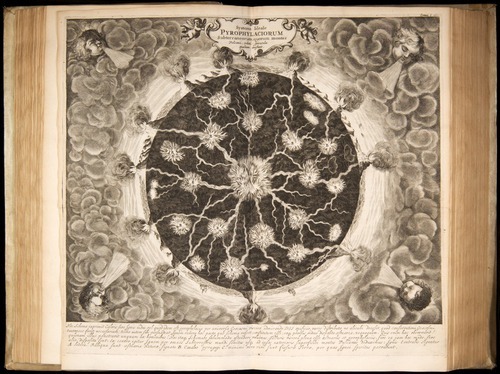 See Kircher’s complete Mundus Subterraneus (1665) in the Online Galleries. 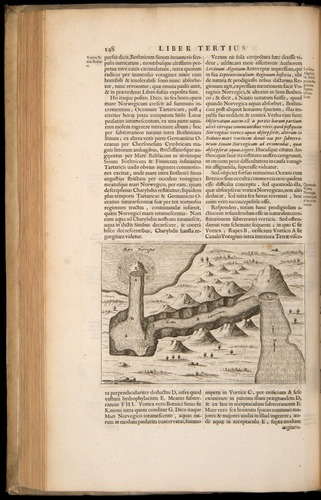 This entry was posted in History of Science and tagged Geology. Bookmark the permalink.